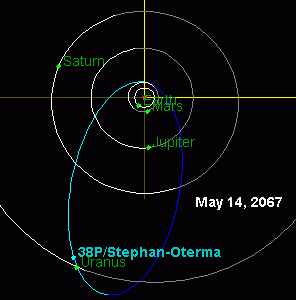 38P/Stephan–Oterma (also known as Comet Stephan–Oterma) is a periodic comet with an orbital period of 38 years. It fits the classical definition of a Halley-type comet with (20 years < period < 200 years). It was discovered in January 1867, by Jérôme Eugène Coggia at Marseilles Observatory, France. 38P/Stephan–Oterma last came to perihelion on November 10, 2018. It was recovered by Pan-STARRS on June 24, 2017 while 5.3 AU from the Sun. The next perihelion passage is August 28, 2056. It has perihelion near the orbit of Mars and has aphelion near the orbit of Uranus. Acting like a centaur-hybrid, between the years 1982 and 2067, this object will make close approaches to the giant planets Jupiter, Saturn, and Uranus. If this object did not have a coma and (for some definitions) had a perihelion beyond Jupiter's (5 AU), it would be considered a centaur. Comet 38P passing within 1.6AU of Uranus in 2067. ^ a b c d "JPL Small-Body Database Browser: 38P/Stephan-Oterma" (last observation: 1981-04-04; arc: 114.18 years). Jet Propulsion Laboratory. Retrieved 2009-05-07. ^ a b c Seiichi Yoshida (2004-07-31). "38P/Stephan-Oterma". Seiichi Yoshida's Comet Catalog. Retrieved 2011-10-23. ^ a b "JPL Close-Approach Data: 38P/Stephan-Oterma" (last observation: 1981-04-04; arc: 114.18 years). Retrieved 2009-05-07.